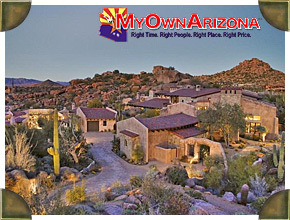 Welcome to the online MyOwnArizona team presentation of Luxury Homes For Sale in Estancia Scottsdale. Estancia is a top-ranking and dynamic residential Scottsdale community acclimated to your needs. At Estancia, you will find a comfortable Scottsdale home that reflects your taste and distinction, from elegant waterfront homes and palatial Scottsdale golf villas, to private patio homes, charming condos open and friendly single-family homes. Estancia in Scottsdale is a small town with a growing and relaxing urban environment. Please contact us to receive the luxury packet on Estancia Scottsdale. Estancia AZ homes are located in the Pinnacle Peak area of North Scottsdale in Scottsdale, Arizona. Estancia is a gated community in North Scottsdale with spacious Estancia homes on palatial lots. Estancia is well known for being a prominant Scottsdale golf course gated community where Estancia residents take advantage of the benefits by using the world class golf course literally in their backyard. Estancia is a North Scottsdale gated luxury golf community with this private golf course and exclusive country club. Situated on over seven hundred acres, Estancia rests on the northern slope of Pinnacle Peak, adjacent to Troon North. Incredible sunsets, scenic golf views, Estancia custom golf homes and world-class clubhouse with golf course designed by Tom Fazio, makes Estancia a desirable home for many looking for an gated private golf community in Scottsdale. Over two hundred custom Estancia home sites exist within Estancia with an additional forty Tuscan style villas in The Homes of LaScala. Estancia also caters to Tennis players with top of the line Scottsdale private courts. Your Scottsdale MyOwnArizona team is the top Arizona realtor group serving the Scottsdale luxury area in the industry. Let our MyOwnArizona business professionals be of assistance to you and your needs.